Eminem's upcoming release, "Marshall Mathers LP 2" has been a labor of love - emphasis on the "labor." As the Detroit rapper tells Rolling Stone in its November 7 issue,"right now, I'm probably working harder than I've ever worked in my life." 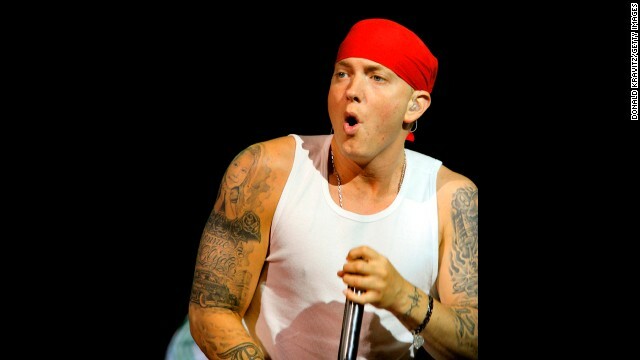 And yet, as Em fans can attest, you wouldn't know it from his effortless flow on recently released tracks "Berzerk," "Rap God" and "The Monster." Those hungry for more samplings of "MMLP2" might've helped themselves to the album's leak on certain websites Wednesday, just ahead of the November 5 release date. Expectations for the album are running high, and not just because of the strong singles that have been released thus far. The title alone is bringing plenty of pressure on the star, since it indicates that this will be a continuation of 2000's standout "Marshall Mathers LP." Yet "MMLP2" is "not necessarily a sequel, as much as it is a revisitation," Em tells RS. "So there's not gonna be, like, continuations of every old song on there or anything like that. To me, it's more about the vibe, and it's more about the nostalgia." In order to pull it off, Eminem has been skimping on sleep, equating the creation of "MMLP2" to putting together an album, a movie and a soundtrack all at once. "(A)round the time of 'The Eminem Show,' when I was also doing the '8 Mile' movie and soundtrack and score and s*** like that," he said. "This is probably the equivalent of that, but all focused on the record." plain ones are ok too. Look at the picture, then read the first three words. Then ask, "What's he doing?" That's emineminem ummm's b l o w job face when he's in the dressing room with his rap star buddies. Hey, M.A.P., put the vodka down. There's a h o m o er ot ic photo for you to schlobben die knobben over, warmer Brueder mit der arshloch gefullt mit Turken jelly! Ellen, you are the most vile, disgusting 50 year old man I have ever met. what's he doing in that picture? Looks like he's giving the ol' trouser snake a workout. He's making the O face. Quick, grab some paper towels! Dayum! Troll busta been busy up in here! Fo' shizzle! Yeah, right. It's amazing to see the blogs without all the craziness. I was thinking that with a big grin on ky face..lol. A good night to you, as well. Now get over to the Lady Gaga story and get to work on the HACKING HOES. is doing Marquee's commentators a favor by cleaning up the blogs-the least you can do is ask nicely instead of demanding it. Pleeeease Mr. Troll Buster, sir could you do something about the How Hackers that type in ALL CAPS. We'd be ever so grateful.